You can easily delete Screen Time limits that have been set for apps or app categories on an iPhone or iPad, allowing unlimited time usage of the app or app category again, or to re-define a more specific Screen Time limit. For the unfamiliar, Screen Time is a feature of iOS that allows for setting time limits on app usage, either for individual apps or even for entire categories of apps. It’s incredibly useful for iPhone and iPad usage, whether you simply want to reduce your own usage of a particular app or type of app, or perhaps especially for parents and childcare providers who want to limit device time. 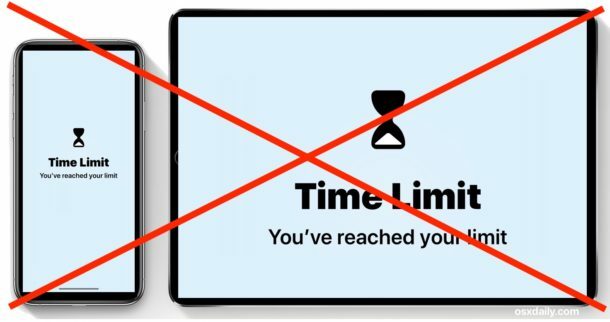 This guide will show you how to delete a time limit that has been set on an app, or entire app category, through Screen Time in iOS. This works the same to remove Screen Time limits whether they’re set on an iPhone or iPad. Once the app limit or category limit has been removed, the app or apps in that category will no longer be limited by whatever time limit had been applied. For example if you had previously set a Screen Time limit for social networking on an iPhone or iPad and then you removed the limit for the social networking category, then all apps that fall into that category – Facebook, Twitter, Instagram, Snapchat, etc – could be used for an unlimited amount of time again (unless you set another time limit for them anyway). Of course you can also disable Screen Time in iOS completely if you’d like to go that route as well, but turning off Screen Time also stops the reporting features, which many users like as it shows them how much time they’re spending in various apps and provides insights into their iPhone or iPad device usage. Screen Time requires iOS 12 or later, so if you don’t have a newer version of iOS on the iPhone or iPad then you won’t find the ability to modify Screen Time usage let alone set it in the first place because the feature didn’t exist in earlier iOS releases. * Note that if Screen Time has a passcode set in iOS, the proper Screen Time passcode must be set before you can access the specific Screen Time settings. You can always remove or disable the Screen Time passcode as well, but that’s a topic for a different article. Do you know of any other helpful tips or tricks for removing Screen Time limits or deleting Screen Time settings on an iPhone or iPad? Share with us in the comments below! Is there a way to delete a single app from screen time? I use my alarm clock and is on all night so if I wake up I can see what time it is. Obviously that has the highest a average of screen time. I would like to delete this entirely. Is it possible? why i don’t see this article? What do you mean? You’re commenting on the same article right now, what happens when you try to load it? Thanks for sharing your new Tip, but I didn’t remove it but deactivated one week after Update. That saved me the battery life. Thank you so much for this information, my iPad was running out of battery faster than it did in the past. Once I have deleted limits, my battery is almost back to normal. I might actually just disable this feature to go back to a battery that works perfectly. I want to delete the screen time app. It asks for a pass code. I never set a pass code. Is there an apple pass code that comes with the app? If so what is it. If you don’t have it and I didn’t set one is there a default? Cannot change settings – needs password that was never setup by user?? How to change settings without password?